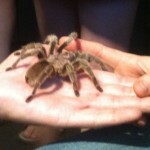 Last week I held a tarantula named Rosie. 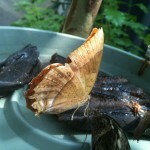 A friend and I heard of this hairy possibility a few weeks earlier and decided to visit her at the Butterfly Pavilion on Monday. Spiders in general disturb me, I suppose this could be described as fear. I thought holding Rosie would be a good safe way to face some of that, like a controlled fear. Rosie liked my warm hand and would not immediately move off of it, which made me a little nervous, mostly because I heard they can bite. I didn’t know if the ability to bite had been removed from this arachnid ambassador or not, and I actually prefer not knowing. It preserves the thrill. In between the butterflies in my stomach and the promise of winged butterflies is a room with a bunch of glass cages with jellyfish, crabs, urchins, lobsters, starfish, etc. I expected an octopus but the only one I saw was inanimate, unreal, enlarged and looming over the top of the jellyfish aquarium. I petted a starfish. It didn’t seem to notice. 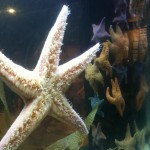 They don’t seem to do much either, until you get a view of their underside up against the glass, or listen to a guide who volunteered a story about one of the starfish eating a sea cucumber while no one was looking. I couldn’t resist breaking into a few really horrible fish puns… did it also want some jelly on its salad? I guess it just had the urchin to do it. 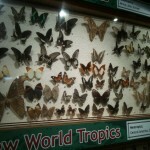 Next we went to what should have been the primary reason for this excursion, the butterfly area. There’s something relaxing about watching these ridiculously beautiful creatures stumble vertically from flower to flower. I wonder if it feels like a straight line to them. Maybe their flight pattern has something to do with the rotting fruit we caught some of them sinking their proboscises into. While not the primary reason for our trip, I admitted to having a special agenda with the butterflies, in that I wondered if I could will one to land on my shoulder. I told this to my friend, but did not fully convey that I wanted one to come of its own accord. I waited, non-moving, for a while. I went up to a few and leaned my shoulder in. No butterfly. Eventually my well-meaning friend could take my nonsensical patience no longer, coaxed a butterfly onto his finger and then directed it onto my shoulder. It immediately flew off. While I appreciated my friend’s gesture, it flying away made me glad. For one thing I simply would not wish for a butterfly to land or remain on my shoulder if it does not want to be there. But also, more practically, there are signs up saying not to disturb the butterflies. I suppose this is probably not followed to the letter judging from the tattered edges I saw on some of their wings. And maybe such precautions deny them their own controlled fear. Maybe the rotting fruit means they have no fear anyway. On exiting the butterfly area there is a hall with mirrors on either side. If you look at it a certain way (which really means you look at your friend, or you put your camera off to the side a little to take a photo – no, this does not break the camera like you might expect) you see dozens of you replicated in the reflections. 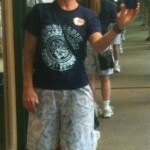 This is not unlike a photo I was compelled to have taken of me a few weeks ago. Since then I keep happening upon situations that remind me of it, both literal like this experience at the Butterfly Pavilion, but also several abstract metaphorical situations as well. After the fluttering butterflies we had a little time left and decided to bid Rosie farewell again before leaving. She still was the primary fascination of this place for me. I guess in the end, it was more satisfying extending a warm hand to a tarantula than a cold shoulder to a butterfly. That’s a powerful metaphor. Whoa. I wasn’t quite sure what I meant by the statement, while I thought I had things clear and together at the beginning of the story, roles got switched around a bit by the end and while I felt strongly about the statement, I was scratching my head a little at its meaning to me. Perhaps it is something that will reveal itself later. Things happen this way for me sometimes.